For the perfect wedding day look to one of the very best wedding venues in Wellington, NZ. Here at Dockside we feature location, style and flexibility. We are located right on the water and have Megisti Sailing Charters docking just outside. Arrival and/or departure by boat or helicopter is possible and makes for great photo opportunities. 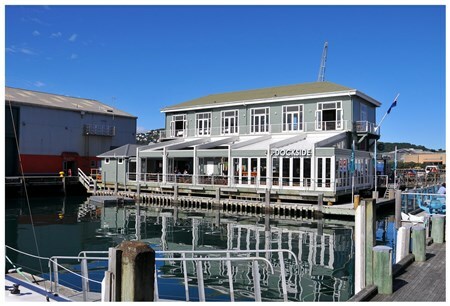 Dockside Restaurant & Bar is a wedding reception venue in Wellington that offers you a variety of spaces and services to match the size of your wedding and budget. The main deck offers room for 300 people for a cocktail reception or 150 person capacity for a sit down dinner. If you add our inside bar you can increase your standing capacity to about 400. After dinner dancing is available on the main deck, which can be opened up completely on summer days. We can provide canapés and dancing all night for up to 500 guests if you choose appetizers only in a stand up environment. With one of the largest outdoor dining areas over water in the Southern Hemisphere, it would be difficult to find a better wedding venue to enjoy Wellington’s waterfront. With our on-site wedding planner offering you a stress free experience we make it very easy for you to have your wedding here. We take care of every detail from music, audio equipment, table setting, themes and flowers. It is our recommendation that you visit us early in your wedding planning to get a feel for the kind of ambience we can create for your special day. Make an appointment and have our in house wedding planner show you around. The harbour views and the extensive outdoor decks are fabulous. The setting allows a natural flow from pre-dinner drinks to dining and dancing. Dockside offers you flexibility, location and style. We handle all the details of your wedding so you do not have to worry about a thing.